No Facebook, Twitter or WhatsApp. That's what's becoming increasingly common in some African countries, where governments have periodically shut down the internet or blocked social media platforms. It's a year since Chad blocked access to the most popular social media sites. Sudan had limited access during anti-government protests, as did the authorities in Zimbabwe. Digital rights activists say it's censorship, but governments argue it helps maintain security. So how do governments shut down or block the internet in practice? A government can limit access to the internet by ordering internet service providers (ISPs) to limit access to their subscribers. In the first instance, this is likely to be a block on commonly used social media sites. As a more extreme measure, the authorities can order service providers to block all internet access. In 2018, there were 21 instances of partial or total internet shutdowns, compared with 13 in 2017 and 4 in 2016, according to Access Now, an independent monitoring group. 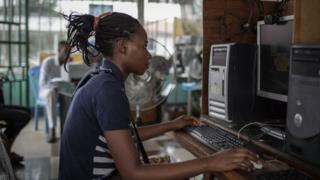 Ivory Coast, DR Congo, Chad, Cameroon, Sudan, Ethiopia, Mali, Nigeria and Sierra Leone restricted access to the internet last year. It's also a global trend. In 2018, there were 188 shutdowns, compared to 108 in 2017 and 75 in 2016. This includes complete outages, social media shutdowns and throttling. In each country, it's down to the individual service providers to carry out these instructions from the authorities to block access. One method used is known as URL-based blocking. This is a filter which prevents access to a list of banned sites. A user trying to access these sites might see various messages such as "server not found" or "this site has been blocked by the network administrator". Another method is called throttling. This approach severely limits traffic to specific sites, giving the impression that the service is slow, thereby discouraging access. This is more subtle, as it's difficult to know whether sites are being actively restricted or whether poor infrastructure is to blame. As a final measure, telecoms companies can be required to shut down their services entirely, preventing all data access. Can service providers say no? The ability of governments to censor the internet depends on their ability to exercise control over telecommunications companies. Internet service providers are licensed by governments, which means they risk fines or the loss of their contracts. Operators may have the right to appeal to the courts, but in practice they rarely do. However, there have been exceptions. Earlier this year the courts in Zimbabwe ruled in favour of reinstating internet access after the government ordered restrictions. In response, the government of Zimbabwe has implemented new regulations allowing them greater control over the internet. Zimbabwe's information minister Monica Mutsvangwa says this will "ensure that internet and related technologies are used for the good of society, not to violate national security." But there are also examples where governments wishing to shut down the net have an easier task. "There are exceptions like Ethiopia where telecommunications is still not liberalised", says Dawit Bekele, Africa Regional Bureau Director for the Internet Society. "There is a de-facto single gateway owned by the government operator that can easily be used to block the Internet," he says. Unless access to the internet has been shut down completely, there are ways that individuals can manage to evade these barriers. The most common method is the use of virtual private networks (VPNs). These VPNs encrypt data paths, making it difficult for service providers to block access to restricted sites. Governments can also block VPNs, but are less inclined to do so because this also severely inconveniences foreign diplomats and large companies which use them. Some African governments have pointed to the rise of "fake news" online as a reason for enforcing restrictions. But some analysts and opposition figures consider this an excuse for suppressing groups critical of the government, which often organise on Facebook and WhatsApp. "Before, during and after elections, governments tend to block the internet because of dissent," says Mr Bekele.